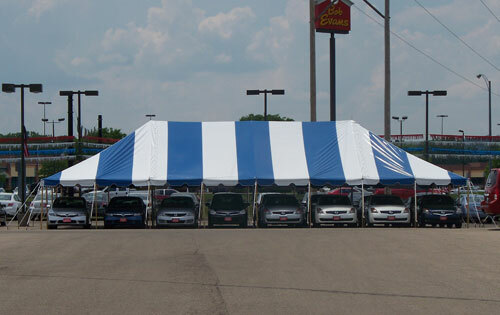 An excellent way to provide additional coverage either for a commercial or residential application is by using Celina's classic pole tent. The top is striped and 95% bonded with heat sealed construction. Also, there is 2 inches of reinforced webbing at each of the poles. Each pole measures roughly 7 feet in length and is made from a highly reliable aluminum material. There's no need to purchase stakes or ratchets because both of these required items come with your purchase of this great product.